Cyprus has officially agreed to a set of measures that will release a 10 billion-euro ($12.8 billion) IMF-EU bailout. The IMF, which is contributing 1 billion euros, says they are “challenging” and will require “great efforts” from its population. The measures will consist of doubling taxes on interest income to 30% and raising corporation tax from 10% to 12.5%. The plan, designed to stabilize Cyprus banking system and government finances, was agreed in principle last week. Harris Georgiades appointment followed the resignation of Michalis Sarris on Tuesday. The plans for the two largest banks, Bank of Cyprus and Laiki, are especially controversial, as they will involve heavy losses for depositors with large balances in their accounts. The IMF, which is providing 10% of the bailout money, said 95% of account holders would be protected. The majority of accounts have less than 100,000 euros in them, which will not be affected. However, depositors with more than 100,000 euros will lose some of their savings. Although the exact amount has still not been decided, reports have said they could lose up to 60%. 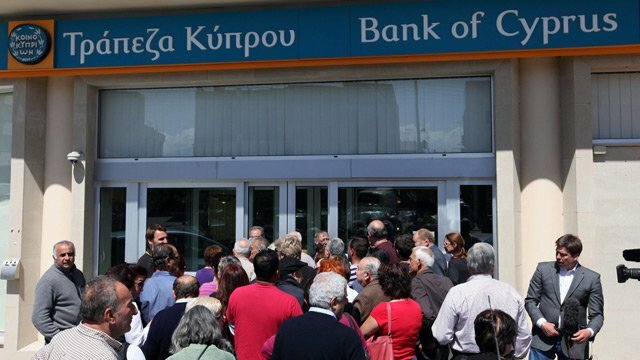 Cyprus agreed last week to shut down Laiki and transfer deposits of under 100,000 euros to Bank of Cyprus. Christine Lagarde added that its aim was to spread the pain, and “seek to distribute the burden of the adjustment fairly among the various segments of the population and to protect the most vulnerable groups”. Cyprus is in recession, with unemployment at around 15% and gross domestic product (GDP) down by 3.5% this year. The country is already planning to introduce austerity measures equivalent to 5% of GDP between 2013 and 2015 through tax rises and spending cuts, but Christine Lagarde said further measures were needed. The IMF chief said the corporation tax increase and raising of the tax on interest rates to 30% would help bring in another 2% of GDP. In order to tackle its debt, additional cuts worth 4.5% of GDP would also be needed over the medium term to reach the target of a budget surplus of 4% of GDP by 2018, the IMF said. Cypriot President Nicos Anastasiades warned there would be “difficult days ahead” that demanded a collective effort. The IMF said the reform programme would also lead to changes in banking supervision and transparency. Cyprus’s banking system has been seen by some as a haven for firms, particularly Russian businesses, who wish to avoid close scrutiny of their affairs. The IMF said that the international rescue effort, which also involves the EU and the European Central Bank (ECB), would be “well paced”. The IMF’s contribution will need to be ratified by its board in the coming weeks.